Did Neanderthals honour the raven? A new discovery by archaeologists in Crimea is providing evidence that ancient Neanderthals had a high cognitive and artistic ability. That evidence is the carved leg bone of a raven also raising the question (not actually included in the archaeologist’s paper) does the relationship between human and raven go back to a period between 38,000 and 43,000 years ago? For more than a century, archaeologists have debated the question of just how smart the Neanderthals, the species that preceded what archaeologists now call “Modern Humans” into Europe and west Asia and there is increasing evidence of Neanderthal intelligence. 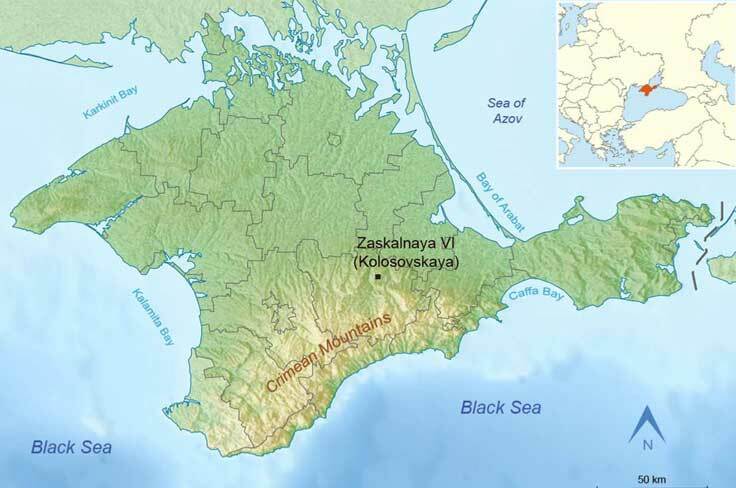 The raven bone fragment which has been dated between 38,000 and 43,000 years ago, was found at the Zaskalnaya VI site in Crimea. It is described in to a study by Ana Majkic at the Universite de Bordeaux and colleagues, A decorated raven bone from the Zaskalnaya VI (Kolosovskaya) Neanderthal site, Crimea. published in the open access journal, PLOS ONE on March 29, 2017. The site in the Crimea was once a campsite in a river gully. The radius bone fragment has seven notches. Microscopic analysis of the notches indicate that they were produced by the to-and-fro movement of a lithic (stone) cutting edge and that two notches were added to fill in the gap left between previously cut notches, probably to increase the visual consistency of the pattern. The study worked to duplicate and test the work of the Neanderthal crafts person by examining sets of notches cut by nine modern experimenters on the leg bones domestic turkeys shows that the variations recorded on the Zaskalnaya set are comparable to experimental sets made with the aim of producing similar, parallel, equidistant notches. The object represents the first instance of a bird bone from a Neanderthal site bearing modifications that cannot be explained as the result of butchery activities. That means the argument that bone notches are symbolic argument can be built on direct evidence. The respect that British Columbia and Alaska First Nations have for the raven is found in countless legends and stories. 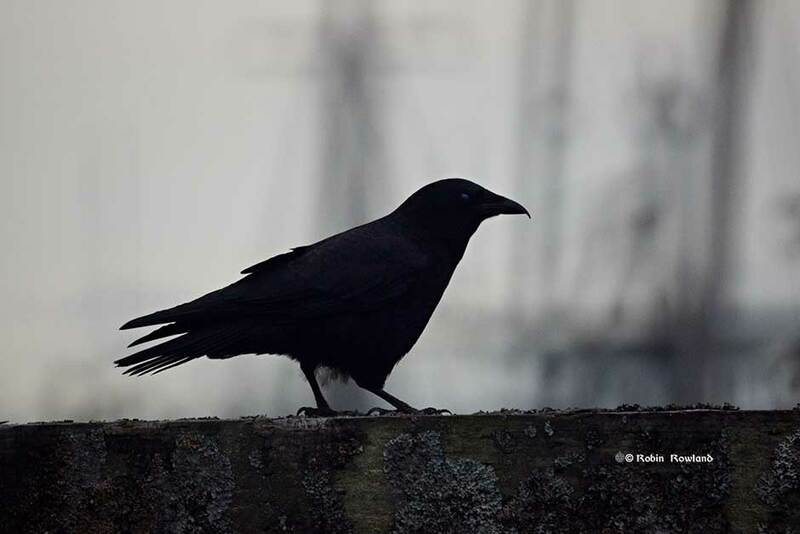 Other cultures have honoured the raven including the Celtics who believed the raven was symbol of war, the Vikings and Greeks where the raven was a messenger of the gods, to name just a few. The discovery of the raven bone in a Neanderthal cave may mean that the relationship with the raven is much more ancient than previously believed. The paper says evidence of burials, collection of rare items, production of engraved and perforated objects, personal ornaments, pigment use, and the extraction of bird feathers and claws support the notion that Neanderthals engaged in symbolical behavior, independently from the influence of anatomically modern humans. Neanderthal burials of infants, children, and adults have been reported at several sites throughout Europe and the Near East, some of which are associated with grave goods. Pigment use among Neanderthals dates back as far as between 200,000 to 250,000 years ago. Pigment use became a more widespread practice about 60,000 years ago. A string of new discoveries have shown that Neanderthals regularly exploited birds. The activities conducted by Neanderthals that may reflect their involvement in symbolic activities have been found in Italy, in caves in Gibraltar, nine sites in France and one Croatia. Those discoveries indicate that cut-marks and scraping marks on upper limb bones mean that feathers were purposely detached from the wings of seven different bird species, including the common raven and the red-billed chough (a red beaked and red legged crow that is sacred in Wales and Cornwall). Others were the white-tailed and golden eagles, two species of vulture, and an unidentified raptor. The study says that removal of feathers and claws is interpreted as proof that these objects were used as personal ornaments by Neanderthalsm the study says. Feathers and claws do not survive archaeologically. So far, no clear modifications for suspending or threading the claws were found so far on bird talons, so up until now this was considered circumstantial evidence. As for the raven bone found in Crimea, the scientists say it is more probable that the Neanderthal took the decision of adding notches two and six, after completing the first set and realizing that its production left two gaps. notches, that it was important to add two notches in order to create a visually more regular and consistent pattern. The archaeologists conclude the artistic hypothesis more probable because adding the two very small and superficial notches added virtually nothing to the gripping power of the object`s surface. The results of the study pinpoint that a clear effort has been put to reach the goal of producing not just random but instead equidistant notches, that would have been perceived as regularly spaced. This implies that the resulting pattern could have conveyed an information, not directly linked to the object function, communicating to the user, and likely other members of the Neanderthal group. In this respect the sequential notches on the ZSK raven bone represent the first case of bird bone use by Neanderthal for which a symbolic function can be argued on direct rather than circumstantial evidence. A new study suggests that the health of the grizzly bear population is also a strong indicator of the health of Pacific salmon—and perhaps surprisingly, allowing grizzlies to consume more salmon will, in the long term, lead to more, not less, salmon. The study, led by Taal Levi, of the University of California at Santa Cruz and colleagues from Canada, suggests that allowing some more Pacific salmon to escape the nets of the fishing industry and thus spawn in coastal streams would not not only benefit the natural environment, including grizzly bears, but could also eventually lead to more salmon in the ocean. Thus there would be larger salmon harvests in the long term—a win-win for ecosystems and humans. The article, “Using Grizzly Bears to Assess Harvest-Ecosystem Tradeoffs in Salmon Fisheries,” was published April 10 in the online, open-access journal PLoS Biology. In the study Levi and his co-authors investigate how increasing “escapement”—the number of salmon that escape fishing nets to enter streams and spawn—can improve the natural environment. “Salmon are an essential resource that propagates through not only marine but also creek and terrestrial food webs,” said lead author Levi, an environmental studies Ph.D. candidate at UCSC, specializing in conservation biology and wildlife ecology. Salmon fisheries in the northwest Pacific are generally well managed, Levi said. Managers determine how much salmon to allocate to spawning and how much to harvest. Fish are counted as they enter the coastal streams. However, there is concern that humans are harvesting too many salmon and leaving too little for the ecosystem. To assess this, the team focused on the relationship between grizzly bears and salmon. Taal and his colleagues first used data to find a relationship between how much salmon were available to eighteen grizzly bear populations, and what percentage of their diet was made up of salmon. The study looked at Bristol Bay, Alaska, the Chilko and Quesnel regions of the Fraser River watershed and Rivers Inlet on the Inside Passage, just northeast of northern Vancouver Island. The study says adult wild salmon are “critical” to ocean, river and terrestrial ecosystems. As well as humans, salmon are eaten by orcas, salmon sharks, pinnipeds (seals and sea lions). On land, salmon are eaten by black and grizzly bears, eagles and ravens. “We asked, is it enough for the ecosystem? What would happen if you increase escapement—the number of fish being released? We found that in most cases, bears, fishers, and ecosystems would mutually benefit,” Levi said. When salmon are plentiful in coastal streams, bears won’t eat as much of an individual fish, preferring the nutrient-rich brains and eggs and casting aside the remainder to feed other animals and fertilize the land. 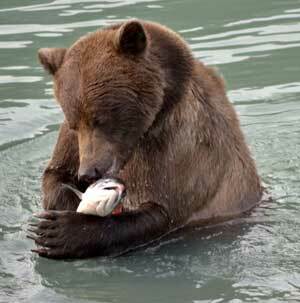 In contrast, when salmon are scarce, bears eat more of a fish. Less discarded salmon enters the surrounding ecosystem to enrich downstream life, and a richer stream life means a better environment for salmon. In four out of the six study systems, allowing more salmon to spawn will not only help bears and the terrestrial landscape but would also lead to more salmon in the ocean. More salmon in the ocean means larger harvests, which in turn benefits fishers. However, in two of the systems, helping bears would hurt fisheries. In these cases, the researchers estimated the potential financial cost—they looked at two salmon runs on the Fraser River, B.C., and predicted an economic cost of about $500,000 to $700,000 annually. This cost to the human economy could help support locally threatened grizzly bear populations, they argue. While these fisheries are certified as sustainable by the Marine Stewardship Council (MSC), the researchers suggest that the MSC principle that fisheries have minimal ecosystem impact might not be satisfied if the fishery is contributing to grizzly bear conservation problems. The researchers believe the same analysis can be used to evaluate fisheries around the world and help managers make more informed decisions to balance economic and ecological outcomes. What do grizzlies eat in northwestern BC ? The current study and previous studies track the grizzly’s diet by studying the nitrogen and carbon istopes in grizzly hair. In one study in the early part of this decade, the BC Ministry of the Environment used guard hairs from “passive hair snags” as well as samples from bears killed by hunters or conservation officers. The 2005 study says “Guard hairs are grown between late spring and fall, thus integrating the diet over much of the active season of temperate-dwelling bears.” Analysis of the isotopes can show what the bears ate over the season. The study identified four elements in the grizzly diet across British Columbia, Alaska, Yukon and the Northwest Territories: plants, “marine-derived nutrients” mostly salmon, meat (primarily from ungulates such as moose) and in inland areas, kockanee salmon. 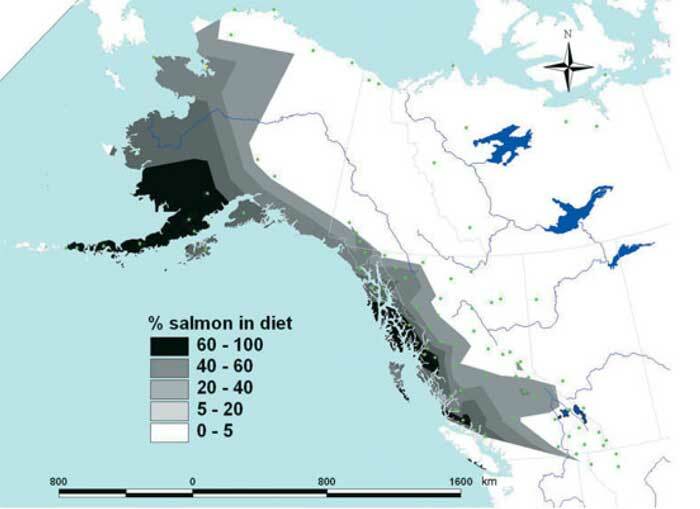 As could be expected, grizzly salmon consumption is highest in coastal areas. Males generally consume more salmon than females, likely because a mother grizzly may avoid taking salmon if there is danger to the cubs from males. The further inland a grizzly is found, salmon is a lesser factor in the bear’s diet. In Arctic regions, grizzlies can feed on arctic char, whales, seals and barren-ground caribou. Funding: This work was funded by an NSF GRF and Cota-Robles Fellowship (TL), a NSERC IRDF (CTD), the Wilburforce and McLean Foundations, and Patagonia. The funders had no role in study design, data collection and analysis, decision to publish, or preparation of the manuscript. The first fossil of a bird, or a bird-dinosaur relative, the archaeopteryx, has fascinated scientists for 150 years since it was first discovered in a quarry in Germany. For all that time there has been a debate, was archaeopteryx, a bird or a dinosaur? Could it fly or were the wings, tipped with claws, helping it climb and glide? Now scientists at Brown University in Providence, Rhode Island, have analyzed a single fossil feather from an archaeopteryx, and come to the conclusion that not only is it highly likely that it could fly, but the archaeopteryx, which was the size of a modern raven, was also as black as its distant descendent, the raven at home here in the northwest, sacred to the First Nations of British Columbia and sacred or honoured in other cultures around the world. 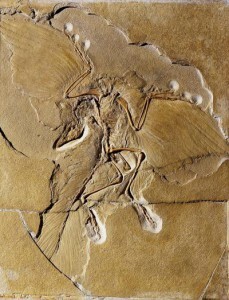 The archaeopteryx feather used in the study was discovered in a limestone deposit in Germany in 1861, a few years after the publication of Charles Darwin’s On the Origin of Species. 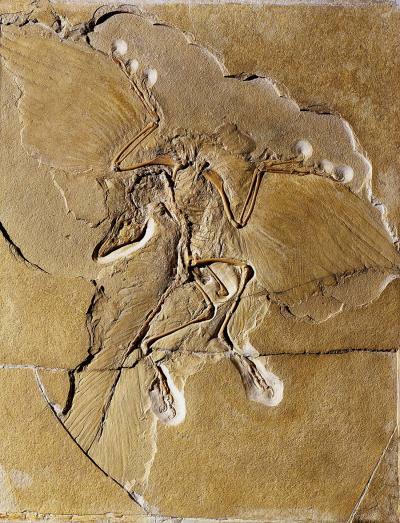 For most of that time, as paleontologists studied that feather fossil and other fossil specimens, popular science portrayed the archaeopteryx as the dinosaur at the base of the bird evolutionary tree. The traits that make archaeopteryx an evolutionary intermediate between dinosaurs and birds, scientists say, are the combination of reptilian features (teeth, clawed fingers, and a bony tail) and avian features (feathered wings and a wishbone). The team examining the fossil feather not only determined that it was raven black but that the wing feathers were rigid and durable, traits that would have helped archaeopteryx fly. Fit for flight from Brown University on Vimeo. The fact that archaeopteryx’s feather structure is identical to that of living birds, shows that modern wing feathers had evolved as early as 150 million years ago in the Jurassic period. Carney, with researchers from Yale University, the University of Akron, used a powerful scanning electron microscope at the Carl Zeiss laboratory in Germany to analyze the feather. They discovered that it is a “covert,” so named because these feathers cover the primary and secondary wing feathers birds use in flight. They were were looking for melanosomes, the organelle in living organisms that contain melanin, which help determine colour. Using the high powered electron microscope, the team located patches of hundreds of the structures still encased in the fossilized feather. “We finally found the keys to unlocking the feather’s original colour, hidden in the rock for the past 150 million years,” said Carney, a graduate student in the Department of Ecology and Evolutionary Biology, studying with Stephen Gatesy. 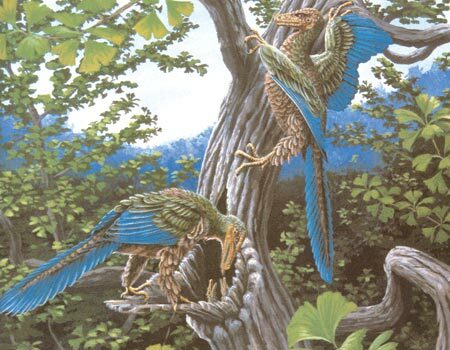 Many artists’ conceptions over the years have shown archaeopteryx brightly coloured, often with brilliant blues like a tropical jungle bird today. Others show it with brownish camouflage like plumage. The team measured the length and width of the sausage-shaped melanosomes, roughly 1 micron long and 250 nanometres wide. To determine the melanosome’s colour, Akron researchers Matthew Shawkey and Liliana D’Alba statistically compared Archaeopteryx’s melanosomes with those found in 87 species of living birds, representing four feather classes: black, gray, brown, and a type found in penguins. “What we found was that the feather was predicted to be black with 95 percent certainty,” Carney said. Time to change the colour. An image of a blue archaeopteryx, as imagined by the Chicago Academy of Sciences as it appears on the Animal Planet website. Next, the team sought to better define the melanosomes’ structure. For that, they examined the fossilized barbules — tiny, rib-like appendages that overlap and interlock like zippers to give a feather rigidity and strength. The barbules and the alignment of melanosomes within them, Carney said, are identical to those found in modern birds. What the pigment was used for is less clear. The black colour of the Archaeopteryx wing feather may have served to regulate body temperature, act as camouflage or be employed for display. But it could have been for flight, too. The study, which appears in Nature Communications, was funded by the National Geographic Society and the U.S. Air Force Office of Scientific Research.